The Galapagos Islands lie in splendid isolation, 600 miles off the coast of mainland Ecuador. Because of this, the equatorial volcanic archipelago is home to some of the world’s most iconic, unique, and threatened species and habitats. Most of the islands that make up the Galapagos are uninhabited, and visits are either heavily restricted or prohibited. 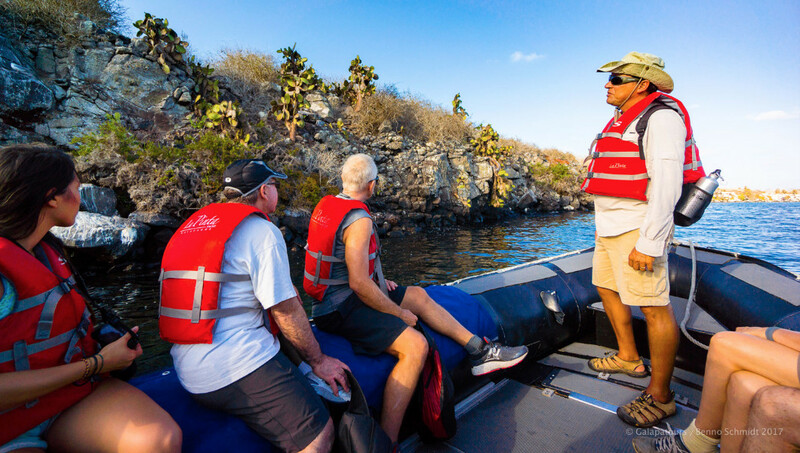 This makes a voyage of discovery by boat the perfect way to see marine iguanas, Galapagos sea lions and penguins, and even to snorkel with them. In the highly regulated National Park, luxurious purpose-built yachts and catamarans sleeping only 16 guests maximum offer the most intimate - and luxurious - way to experience the true nature and beauty of the islands. Planning your ultimate adventure to the islands is now much easier thanks to a new service from South American tourism experts Galapatours.com. By entering your preferred dates, Galapatours will present you with a curated selection of the best luxury vessels and itineraries that are available when you’re travelling. Their senior staff have stayed on every boat they list, and the comprehensive descriptions available help you find exactly the right mix of luxury and adventure for you. As well as a wonderfully intimate luxe experience, a naturalist cruise in Galapagos enables you to see far more during your stay than a hotel-based visit. Travelling from island to stunning island by night, you wake up to a different experience every morning. Led by a fully bilingual expert naturalist guide, itineraries include land excursions, kayaking and snorkelling adventures, trips through mangroves in small motorboats known locally as “pangas”, and more. There’s no doubt, however, that the stars of the Galapagos show are the iconic species that a cruise allows you to encounter. With their lack of fear of people, your wildlife encounters in the water and on the shore will be remarkable. Watching these gentle giants slowly push through the undergrowth just an arm’s length away is an unforgettable experience. 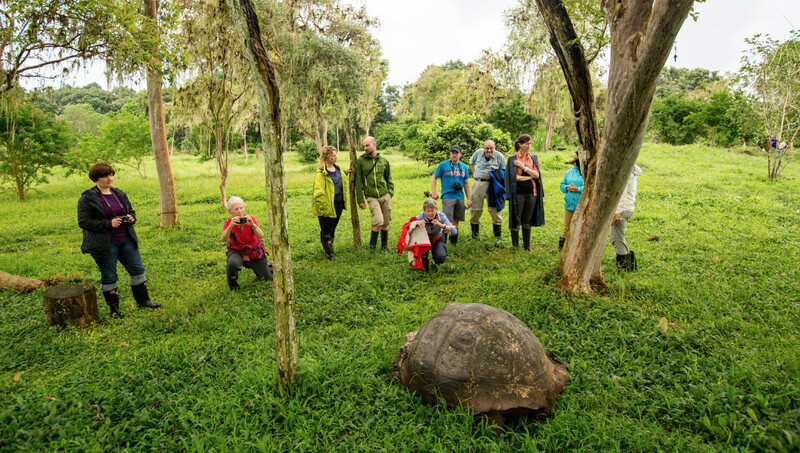 Living to over 100 years in the wild, you can visit conservation centres where the sub-species of tortoise are being captive bred for release to secure their populations. The world’s only seafaring lizard, the marine iguana is another unique species that can only be found in Galapagos. Walking along white sand beaches you will find them basking on the rocks, sneezing out the salt they take in when feeding underwater. Put on your mask and snorkel and you can swim with them as they head under the waves to feed. Another unique Galapagos creature, the blue-footed boobies always raise a smile with their clown-like walk and their remarkable feet. Your naturalist guide will explain how the blue colour comes from pigment in their seafood diet, and how females are attracted to the males with the brightest feet. Another species that is found nowhere else but the archipelago, the flightless cormorant lost the ability to fly over millennia. Thanks to the lack of predators in the Galapagos and their seafood diet, strong swimmers prevailed over flyers, and as evolution prevailed, so gradually the species became grounded. These small, rather plain birds have a place in scientific history that belies their unremarkable appearance. It was the differences in the beak shapes of the finches he found on various Galapagos Islands that led Charles Darwin to his groundbreaking work on evolution, changing our understanding of the natural world forever. As well as these and other amazing animal encounters the naturalist guides on your cruise will provide a wealth of fascinating information about the creatures, habitats and conservation of the islands. Active days full of excursions are complemented by stunning food and luxurious amenities as you relax on board your yacht. Galapagos is renowned as an all-year-round destination, with plenty to see whenever you chose to visit. Galapatours.com has lots of useful information about what you can see at different times of the year, as well as a comprehensive guide to the wildlife and the islands you can visit. So if you’re looking for a unique destination for an active adventure and you want to spoil yourself with a luxury experience, a Galapagos cruise could well be the perfect combination for you this year.